Some of the cool and useful food, craft and sustainability skills that your grandparents knew, but probably didn't teach you! Welcome to the Country Skills blog! This week, my choice of recipe was guided by the fact I have two chicken breasts in the fridge that need eating today. Which, if you think about it, is an ordinary enough problem in a country where chicken breast portions are some of the most popular cuts of meat bought daily in our supermarkets. Now, I would normally buy a whole chicken and portion it up myself, but for reasons not worth going into here, on this occasion I’m the ‘proud’ owner of these two rather aggressively trimmed, skinless and boneless breast pieces. And I can immediately think of at least a dozen things to do with them, too – the trouble is, it’s Thursday, and I’m due to do a Cooking the Books post, so none of my usual go-to recipes will do, I need to find something different from among the extensive cookbook collection. Cross-legged on the floor by the bookcase, I must have gone through at least half a dozen of my favourite books – Jamie Oliver, Nigel Slater, Hugh Fearnley-Whittingstall and even the Two Fat Ladies all let me down, their chicken breast recipes either variations on something I already regularly make – and prefer my version to theirs – or requiring an exciting range of exotic ingredients which aren’t in my kitchen cupboards and which, I suspect, I might have had trouble finding in our local village co-op! 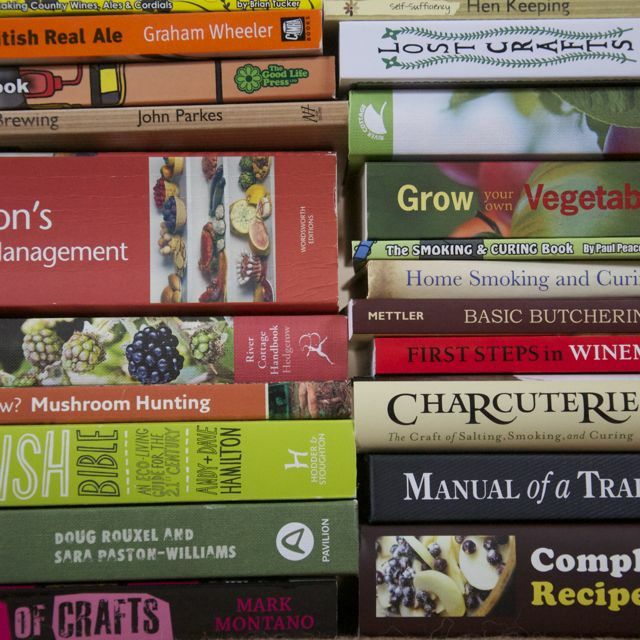 So, down to my second string of cookbook options, the ‘collections’ – Good Housekeeping, Australian Woman’s Own, even the National Trust, and found the same problems here, too. What was going on? And then I spotted a paperback book which, I have to say, I’d forgotten we own, but the spine caught my attention, saying simply ‘Chicken’. Here, surely, would be the answer I was looking for? I can’t remember whether this book came to us as a gift, or as a remaindered-bin find, but I’m pretty sure I haven’t cooked from it before. A flick through, though, came up with the goods – a recipe for spaghetti puttanesca with chicken breast. Perfect, a taste of summer for a winter supper, and because the recipe called for fresh cherry tomatoes as the base for the sauce, an opportunity to substitute some of my chopped and frozen home-grown tomatoes. Put the oven on to heat at 180 C.
In a frying pan, heat a tablespoon or two of olive oil. Mince up four anchovies, and the garlic, and add these to the pan with about a quarter of a teaspoon of the dried chilli flakes. Fry until slightly browning, then add a teaspoon each of dried thyme and oregano, and about half a teaspoon of rosemary. Slice the chicken fillets in half to make four half-thickness fillets, and mix these with the herbs and flavours in the pan, coating evenly, and fry lightly on both sides, until just golden. Then transfer the chichen to an oven proof dish, with all the tasty extras, and put it in the oven. Return the frying pan to the hob, add a little more olive oil and a knob of butter, and once this has melted, the fresh tomatoes. Here I deviate from the recipe in the book, quite significantly and without apology. The tomato sauce in the recipe is just fresh tomatoes, red wine, olives, salt & pepper. I think it needs a little more than that to stand up to the highly-flavoured chicken fillets. Add the sun-dried tomatoes if you’re using these. They make a great addition if your fresh tomatoes are chopped, like mine, or if you’re using tinned tomatoes, as they’ll add texture to the final dish as well as the lovely sweet flavour. Mine are the dry type (home-made! ), which you can add directly. If yours are in oil, drain as well as you can before adding. Now, you can boil the kettle and get the pasta going. Use a big pan with lots of salted water and a glug of oil to keep the pasta from sticking. Mince another two anchovies, and add these to the tomato in the frying pan, along with a sprinkle of thyme and oregano, and a pinch of chilli flakes. Once this has cooked down a little, add about half a glass of red wine. Keep tasting this tomato sauce as it’s the only way you’ll get it right. Tomato sauces often need a lift in the sugar and acid department, and my favourite way of adding this is by using a splash of vinegar – balsamic is great, but home-made elderberry vinegar is better! Add a pinch of freshly ground black pepper, if you think it needs it. At this stage, notice that your olives aren’t pitted, and swear under your breath. Squeeze out the stones, while keeping a close eye on the spaghetti, to make sure it’s not over-cooking, and on the sauce, to check it’s reducing nicely to a rich dark colour. Chop the olives roughly, and add them to the tomato sauce to heat through. Drain the pasta and mix it into the tomato and olive sauce. Take the chicken out of the oven, and check it’s cooked through (since you sliced it in half, it should be nicely done, cooked through but not dry). Serve the pasta in wide bowls, with the chicken on top, pouring over any pan juices from the chicken. Serve with a sprinkle of freshly grated parmesan. So – the verdict? This is a properly decent pasta dish, with or without the chicken, but the chicken, pan-fried and finished in the oven with all those great flavours, is tender and really very good. I recommend this dish to you. Sadly I can’t say the same about the cookbook! Food Lovers: Chicken by various authors. Recipes selected by Jonnie Léger. 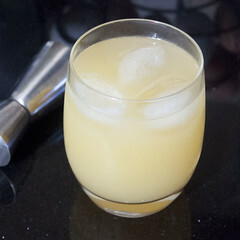 Images & Recipes by StockFood©. Transatlantic Press, 2011. ISBN 978-1-907176-80-7. This is pretty much a ‘copy and paste’ effort of a cookbook, and I can’t honestly recommend you buy it. I may have been unlucky with the recipe I chose, but if the checking and proof reading standards are this unpredictable, I would bet on problems with other recipes, too. It’s quite a pretty book, in fairness, a nicely photographed large format paperback, and I’m sure there are some gems in among the 200 recipes featured, but I can’t see it being worth the hit and miss effort required to find them. And anyway, I rather suspect most of these recipes are probably available on the internet, in places like Epicurious. So, probably not one to add to the collection – and as there seem to be others in the ‘Food Lovers’ series, I’d give those a miss, too. ‘Cooking the Books’ is my self-imposed blog challenge for 2014 – I’ll be trying to cook a new recipe from one of my (rather extensive!) collection of cookbooks once a week, write it up and review it. Wish me luck! I remember my grandmother making her green tomato chutney, towards the end of the summer holidays, when it was clear that the best of the ripening days for the tomatoes she lovingly grew outdoors, on the patio, were over. After her death, my mother transcribed some of her hand-written recipes for my sister and I – including the green tomato chutney recipe. Peel and slice tomatoes. Cut up apples. Chop sultanas. Put in enamelled saucepan with remaining ingredients. Boil gently for 2 hours, stirring constantly until chutney gets dark and tomatoes and apples are well cooked. Bottle when cool. The main thing that struck me about this recipe was the lack of any onions – honestly, I can’t remember whether Grandma used them or not, but I expect onions in a chutney recipe! I made a couple of other, more minor modifications, too (Sorry, Grandma! ), and scaled the recipe up to use as many of the green tomatoes as possible. This, it turns out, was a mistake – the quantity I made was totally impractical, took forever to cook down, and almost ended in disaster, more of which later. Really, I can’t recommend making more than half this batch size. Even if, like me, you have a really big stock pot. Don’t say I didn’t warn you! Life is too short to peel tomatoes (especially 3kg of them!) and I was cooking on a work night, so it was too short to lovingly chop them by hand, too! Out with the food processor, and rough-chop all the tomatoes, onions, and apples, before putting them in the stock pot with the rest of the wet and dry ingredients. 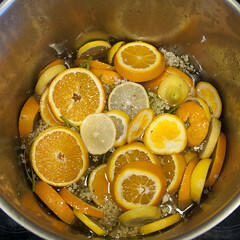 And now, just simmer it, slowly, for what – with a batch of this size! – will be a very very long time! I had to give up and go to bed, fitting a tight lid to the pan, and finished cooking the chutney the following evening. This is one very good reason not to make such a giant batch at once. The other, of course, is that you will require an enormous quantity of jars (with plastic lined lids, or they’ll corrode from the vinegar – mind you, I can’t remember the last time I was an un-lined jar lid!). While I was sorting these out, I took my eye off the pot, and the inevitable happened – the chutney caught on the bottom of the pan, and started to burn. Disaster! I panicked a bit, and then with Hubby’s help, decanted most of the chutney into any available container, leaving the burned stuff on the bottom of the pan. After a damn good scrub, we were back in business, though I remained convinced for the rest of the cooking time that I could taste the burnt flavour in the chutney. This paranoia wasn’t helped by the highly visible flecks of black pepper in the mix, which my brain kept insisting on seeing as burnt bits. I very nearly threw the whole lot in the bin, but a bit of gentle encouragement that I’d done all the work now anyway convinced me to bottle it anyway and hope for the best. I deviated from Grandma’s instructions again here and bottled hot, into hot oven-sterilised jars, as I usually do. Now all that was left to do was to leave the chutney to mature for a couple of months. This (and wanting to make sure this tale had a happy ending!) is the reason for the delay in writing up this recipe. I’m really pleased with the result – after maturing I’m pretty sure it doesn’t taste burnt, and is a lovely gentle fruity chutney, with a lovely black pepper warmth, which goes brilliantly with cheese, ham, and even curries! So this year, at the end of the home-grown tomato season, why not make a batch? But, promise me, make it a smaller one? As for me, I’m still really curious about the outcome of making the recipe as written – so perhaps this year I’ll make a test batch of the onion-free version. Who knows, it may be a revelation? A lovely quick and simple little lunch or light supper dish, and a great egg-using alternative to the ubiquitous omelette or fried eggs for those of us with our own hens. Two big handfuls of grated cheese. Anything you fancy, really, as long as it’s a nice hard full flavoured cheese. I used some Lincolnshire Poacher left over from Christmas, the recipe called for Gruyère, but use whatever you enjoy or have around in the fridge. Put the butter, cheese, and parsley in a medium sized frying pan and warm on a low heat until the butter and cheese have melted. It does look like a lot of fat and butter, but don’t let this trouble you! Crack the eggs in on top of the buttery herby cheese mixture. If your pan is roomy enough to keep the eggs separate, all well and good, but if they meld together in the pan it’s not a big issue. Now just let the pan bubble away until the eggs are cooked. You can spoon some of the lovely butter over the top of the eggs to help cook the surface. You could put a lid on for a while, to help spread the heat, if your pan has one. As the eggs cook, the cheese will take on a lovely golden crispness on the underside. Yum! When the egg whites are cooked, and the yolks are still nice and runny, serve simply with some toast (a good hunk of home-made bread is best – I wouldn’t bother buttering it, personally! ), seasoned with a sprinkle of salt and pepper. All done in under ten minutes, and a wonderful fresh, tasty meal. These eggs went particularly well with toasted Pain de Savoie! In English translation – Phaidon, 2009. ISBN 978-0-7148-4804-4. Hardcover, 976 pages. RRP £29.95. ‘I Know How to Cook’ is quite probably *the* classic of French domestic cookery. Continuously in print in French since 1932, think of this as Delia Smith’s ‘Cookery Course’ from across the Channel, with knobs on! I saw this English translation in a remaindered bookshop a few years ago, and snapped it up. Flouncy French ‘haute cuisine’ this is definitely not – but it covers an enormous amount of ground. With over 1400 recipes, there’s enough here to keep you eating something different every day for about four years! And much of it, like these cracking cheesy eggs, is quick and simple everyday food that’s easy to knock up just for yourself, or for family, after a long day at work. Just to give you a sense of scale, I counted 77 egg recipes (that’s to say, recipes in which egg was the principal ingredient). There’s over a year’s worth of weekly experimentation just to get through that lot! But it also contains a raft of really classic, ‘show-off’ recipes which will knock the socks off your next dinner guests. While it may well have been written originally to help out newly married young wives, there’s truly something here for everyone! This deserves to be one of the standard ‘go-to’ books if, like me, you sometimes find yourself staring at the ingredients you have, in the fridge and cupboards, and could do with some inspiration to help you combine them! Three (or more!) generations of French home cooks can’t be wrong, so go on and add this to your collection. You know you want to! With apologies now, to all but my antipodean readers – the tomato glut, and the long hot days of summer, seem a long way behind us, but there were a couple of recipes that fell through the cracks, for one reason or another. Hopefully they’ll be of use to you later this year! This is a great little recipe for using up those slightly over-ripe tomatoes that inevitably start to pile up once the harvest really gets going. Trim out any obvious damage and discard any that are really ‘over’, cut the tomatoes into even pieces, and lay the tomatoes out in a single layer on a baking sheet. Tuck the cloves of garlic in amongst them, and snuggle the bay leaves underneath, sprinkle over a little sea salt and a few mixed herbs, and roast in the oven at 180 C for 30 to 40 minutes until you’re starting to see some browning to the skins. Discard the bay leaves and put the rest through a mouli with the fine filter fitted (or push through a sieve with the back of a spoon, if you don’t mind the labour!). This will hold back the skins and seeds and allow just the beautiful smooth sweet tomato pulp through. Done! How simple is that? I started with around 1kg of lovely ripe home-grown tomatoes, and ended up with about 350ml of sauce, which may not seem like much but all the flavour and sweetness is concentrated right down into that sauce. I asked Hubby to taste a spoonful and he thought it tasted like tomato soup – and certainly you could let it down with a little bit of vegetable stock, maybe add a sprinkle of fresh basil, and enjoy it just as it is! I made lasagne with it, and it was perfectly wonderful. If you wanted to make a big batch, for keeping into the winter, you could bottle and pasteurise for storage just like the fresh passata. I wish I had, now! I could just do with some roasted bottled sunshine! We seem to have ended the Christmas season with rather a lot of lovely cheese in the fridge! So today’s challenge was to find a recipe in my cookbook collection which would let me use some of it to make something absolutely scrummy. I haven’t baked any bread for a couple of weeks and remembered that Paul Hollywood might have something that would suit… So I dug out ‘Paul Hollywood’s Bread’, which accompanied last year’s popular BBC TV series. And there it was – Pain de Savoie – a lovely looking loaf stuffed with cheese (yes!) and bacon (even better!). Savoie is an alpine region, and as everyone knows, mountain folk have all the best gorgeous stodgy winter comfort food. I had high hopes! Start by weighing your flours and combining in a large mixing bowl, add the salt, yeast, a generous tablespoon of olive oil, and then mix in about two thirds of the water, using your fingers. This should roughly combine the dry ingredients but leave them a little dry, so add the remaining water progressively until all the dry ingredients come together as a ball, leaving the sides of the bowl reasonably clean. I found I had just over 50ml left over, but this will depend on the characteristics of your flours. The dough should look a little like this before kneading. Now knead for 5-10 minutes until it becomes smooth and elastic. You’ll notice the difference – it may take longer than this if you’re not accustomed to kneading, but you’ll get there! I have wholeheartedly adopted Paul’s recommendation of kneading dough on an oiled surface, after a lifetime of using flour – I don’t think it makes very much difference to the dough, but it doesn’t half reduce the mess you make of your kitchen! Once you’re done, the dough ball will look like this. [You’re supposed to add the fried & cooled lardons at this stage. I suffered an unfortunate spot of reading comprehension fail, and didn’t.] Oil the mixing bowl and put the dough ball back inside, cover with a piece of oiled PVC-free cling film, and set aside for a couple of hours until it’s doubled or more in size. Ignore anything you might have heard about putting dough to rise somewhere warm like an airing cupboard, just sitting out on the kitchen counter should be fine, unless it’s very very cold, in which case I’ve done well with putting the bowl in the oven with just the oven light turned on. Letting bread rise in a warm environment certainly will speed the process up, but at the expense of the flavour that develops with a slower, lower temperature rise – and if you wanted tasteless bread, you’d just eat the junk from the supermarket. If like me you’ve forgotten to include your lardons, now is the time to fry them until golden. I used my home-cured black pepper bacon, which is lightly smoked. Incidentally, this is what really good dry-cured bacon should look like, when you’re frying it. See that lovely, clear bacon fat in the pan? That’s all that should ever leak out. And because it’s not wet, and doesn’t leach phosphate water, it fries to a beautiful golden caramelised surface. Fabulous. Once it’s cooked, set aside to cool. And try not to sample too many pieces in the name of ‘quality control, eh? After kneading the little dough balls, they were a bit tight, so I gave them a little time to relax before moving on to the next stage. About half an hour did the trick. In the meantime, cut your cheese up into ~1cm cubes. The original recipe calls for Comté, which would be glorious. This Gruyère, which happened to be what I had in the fridge, and will be a pretty good match, but really any good firm well flavoured cheese will do very nicely – I think a decent mature cheddar would work a treat! Oil your tin – the recipe calls for a 20cm ‘springform’ tin. I haven’t got one of those, but I do have an 8″ loose-bottomed cake tin I usually use for Christmas cake. Paul says to roll out the dough with a rolling pin into tin-sized rounds. I just pushed it out with my fingertips, which seemed to work fine. After putting the first circle of dough in the bottom of the oiled tin, spread out half the cheese cubes over the surface, repeat with the second ball of dough, and then finally press the third circle of dough over the top. Sprinkle the top with a little bit of rye flour, and cover with the clingfilm for another hour or so until it’s nicely risen. Once you’re happy, pre-heat your oven to 220 and, once it’s up to temperature, slide the tin into the oven and bake for half an hour. It should come out a lovely rich mid-brown colour on top. Rest in the tin for 10 minutes before turning out onto a wire rack to cool for as long as you can bear it, before carving off a thick slice, adding a bit of lovely unsalted butter, and cramming it in your mouth. This is really really good bread. The rye flour gives it a lovely nutty flavour without making it heavy. The cheese has melted during baking to leave quite striking square holes in the dough. Hubby compared it to a really good cheese and bacon sandwich, and I suppose that’s it, really. It’s a thing of great simplicity, but simple things can be fabulous and this really is. But of course the simpler the dish, the more it depends on the quality of the ingredients. So, make it! But be sure to use really good cheese and bacon, m’kay? Hardcover, full colour, 224 pages. RRP £20. This is a really great book for anyone interested in bread baking, whether you’ve never baked a loaf before and just want to know how to get started, or have a fair amount of baking experience, there’s something for you here. I would definitely recommend it to any keen but inexperienced home-bakers, as the techniques are well explained and the book is quite lavishly illustrated with step-by-step photography. There are some lovely unusual bread recipes, such as this one, and one or two ‘extras’ to accompany them, and there should be something new to try here even if you’re already a confident baker! I just can’t resist them. A nice cookbook is such a marvellous object, it’s a thing of beauty, solidly bound and gloriously illustrated, as well as containing the promise – such promise! – of tasty food to come. So, I buy cookbooks (and people buy them for me, too, of course), and continue to buy them until they overflow our bookshelves and end up living in piles under coffee tables and stacked against the walls of our little cottage. As I said, it’s a problem. Last year sometime, I had a quick count up – and stopped counting when I got close to 100. All those books – all those different recipes – and yet it’s relatively rare that I cook something completely new. For all the usual reasons – busy lives, habit, and having a really good set of family-staple recipes we come back to time after time. But it’s good to push out of your culinary comfort zone – for how else do we learn? – and with such a wonderful resource at my fingertips (and, sometimes, underfoot!) I really have no excuses! So to welcome in 2014 – and in lieu of a New Year’s resolution – I’ve decided to set myself the challenge, once a week if I possibly can, to cook a brand new recipe form one of my cookbooks, and write it up for the blog, adding a little review of the book itself. Obviously such a silly endeavour needs a name, so I think we’ll call it ‘Cooking The Books’. Today’s recipe is Venison Pie, and was chosen because Hubby found some lovely wild venison at the Farmers’ Market. The recipe is from Darina Allen’s beautiful big hardback cookbook ‘Forgotten Skills of Cooking’, which came to me as a gift from my Dad last year. I’ve scaled down the quantities because there are only two of us (the original recipe serves 8), and made a couple of minor modifications to account for ingredient availability. In general I’m trying to stay as close to the original recipes as I can – or what’s the point, really? This will, inevitably, affect my choice of recipes – I really don’t want this challenge to end up filling my kitchen cupboards and fridge with half-used packs of ingredients that just go to waste! Actually, thinking about it, this is a big factor in why I don’t often cook from cookbooks. But enough housekeeping – let’s get on with the cooking! Start by preparing your venison. Darina’s recipe calls for venison shoulder, cut into pieces, but I had a ~1lb pack of already-cut stewing venison. It’s worth taking a little time to trim out any particularly obvious gristly bits from your meat at this stage. Also try to pull out any deer hairs you discover in your meat (which isn’t a particularly unusual thing to find with wild venison, because of the way it’s shot, handled and butchered). A small onion (I used a red one, but a yellow one, or even a couple of shallots would be fine) halved and sliced. Ideally you might allow this to marinade overnight, but even a few hours will make a big difference. Cover the bowl and place it in the fridge. If, like me, you’re going to use frozen prepared puff pastry to finish the pie, now would be a good time to take it out of the freezer, and either place in the fridge to defrost overnight, or out on the side in the kitchen if it needs to defrost faster than that. Pastry is always better worked reasonably cold,so once it’s defrosted, put it in the fridge so it’s nice and firm. 80-100g of dry cured streaky bacon or pancetta, chopped into lardons or cubes. I used my home-cured ‘Christmas’ bacon (with bay, juniper, allspice and molasses in the cure, lightly smoked), which I happen to have around at the moment. It’s really worth seeking out good dry cured bacon if you’re not going to make your own! Pat the pieces of meat dry with kitchen paper and coat them in seasoned flour (I needed about 2 tablespoons). I picked the meat out of the sliced onions, but this probably isn’t necessary. This bit of the process is pretty faffy, to be honest, and is something I tend not to bother with when making stews. Let me just say, though, it produces the most wonderful, silky, rich gravy, so I may be using this trick a lot more in the future! Meanwhile, in a frying pan, fry off the bacon until it starts to brown and donates some of that lovely bacon fat. Once it’s done, transfer the bacon to a big saucepan. Now brown the floured venison in the bacon fat. You may need to add a little extra olive oil. Transfer this to the pan once there’s some nice colour, and fry off the onions, carrot and garlic for a few minutes before adding them to the pan as well. I couldn’t see why I’d waste the nice sliced onion from the marinade (and the recipe doesn’t appear to specify what should be done with it), so into the frying that went until it softened nicely, and joined the rest of the ingredients in the saucepan. Now we’re called to deglaze the pan with the wine marinade, and transfer this to the saucepan with all the meat and vegetables before topping up the pan with the beef stock (pre-heated, if it’s proper stock) until the meat and vegetables are just covered. I added a bit of extra water and a slosh more wine to make up the volume. Finally add back the bouquet garni from the marinade, cover the pan and simmer very gently on a low heat for about an hour and a half (or a bit longer if required), until the venison is beautifully tender. Keep a reasonably close eye on it, stirring occasionally, and make sure it doesn’t catch on the bottom of the pan. A good handful of mushrooms. Darina wants wild ones if possible. I managed to get some oyster mushrooms and something a little bit cep-looking calling itself a ‘king oyster’ at our local supermarket, I added a couple of chestnut button mushrooms. A handful of cooked chestnuts – these were the vaccuum-packed sort, left over from Christmas. The recipe says these should be omitted if you’re making a pie rather than a stew, but I couldn’t miss the opportunity to use them up! A few teaspoons of homemade apricot jam. The recipe wanted redcurrant jelly, but I didn’t have any. I have a feeling crab apple jelly would work very well here, too. Salt and pepper if required to season. And not forgetting your block of defrosted puff pastry! Wash out your frying pan and heat up a couple of spoonfuls of olive oil. Saute the mushrooms until colouring slightly, and once they’re done, add them to the pan with the chestnuts, cut in halves. Now taste to check your seasoning. The recipe suggests you might slike to add some redcurrant jelly, or a pinch of sugar, or possibly even some lemon juice at this stage depending on how things are coming together. I did find there was a slightly lacking sweet / acid note so substituted about three teaspoons of my homemade French apricot jam (avoiding the whole bits of fruit), one at a time and tasting carefully in between. It’s slightly miraculous, actually – makes such a huge difference to the final flavour. Add a bit more salt and pepper at this stage if required. You could serve it now and call it a venison stew, and it would be wonderful with mashed potatoes on a cold winter’s night. But we’re going the whole hog and turning it into a pie, so transfer the filling into your chosen pie tin – I’ve used my gorgeous, very traditional, white and blue enamelware dish. Get your block of puff pastry out of the fridge and roll it out. The book suggests a way of attaching the pie crust in a two-stage process, fist attaching a strip of pastry all around the edge brushing with water beneath and on top, before adding the pastry lid, trimming the excess, scalloping the edge with the handle of a spoon, and egg-wash the surface, adding some decoration if you wish. Pierce the centre of the crust and put into a piping hot oven for 10-15 minutes before turning the heat down to about 190C until the crust is golden and the contents bubbling hot. If your oven has a hot-spot (most do) don’t forget to turn the pie around at some point to keep the colour even. That’s it – isn’t it beautiful? Time to serve with your choice of accompaniments. Hubby requested roast potatoes, so we had those and steamed broccoli to go with it. What can I say? It looks pretty spanking, and tastes glorious. I love the way the late addition of the sauteed mushrooms means they retain their separate flavour, texture and identity in the dish. The venison is perfectly tender, the gravy is rich and thick and full of beautifully balanced flavour. These quantities will feed four, I would say. I heartily recommend you make this pie! This is undoubtedly a time-consuming and relatively labour intensive recipe, with four separate preparation stages. Consequently it generates quite a bit of washing up, too – I counted a saucepan & lid, a frying pan, a pie dish, two mixing bowls, a colander, chopping board and knives, garlic crusher, pastry board (or your kitchen worktop), rolling pin, an assortment of spoons of different sizes, a spatula, and I’m sure I’ve forgotten a few bits. But nothing unusual and no gadgets or gizmos required. I started marinading the venison just after lunch, and we eventually ate around 7. It’s a reasonably complex recipe, but no part of it is particularly technically demanding and no special skills are required – anyone who can follow a slightly complicated set of instructions should be able to cope! While there are a lot of ingredients, they’re quite ‘standard’ ones and pretty much all of them were already in my fridge and kitchen cupboards, which was a big bonus. Perhaps something a bit quicker and simpler for next week..? ‘Forgotten Skills of Cooking’ by Darina Allen. Kyle Cathie Ltd, 2009. ISBN 978-1-85626-788-5. Hardcover, full colour, 600 pages. This is a fabulous book, full of unexpected surprises – I only realised after I’d written about the copper-cleaning power of salt and lemon juice the other day that this is one of the tips in the back of this wide-ranging tome! As well as a really good range of hearty traditional recipes, both sweet and savoury, with a focus on quality local seasonal ingredients, there are – amongst many other things! – instructions for buttermaking and producing your own clotted cream, curing and smoking techniques for meat and fish, yeasted and sourdough bread baking, and even advice on choosing livestock. It’s also a beautiful book, richly illustrated and nicely printed, which never hurts. I would say that it deserves a place on any cookbook shelf, particularly so if, like me, you’re more interested in traditional farmhouse, country food and techniques than in ‘cheffy’, restaurant-style cooking. I'm a busy professional, and a lazy cook. I'm exploring and experimenting with old country skills to see how they fit into modern (urban and rural) life, and would love to hear your thoughts and suggestions! 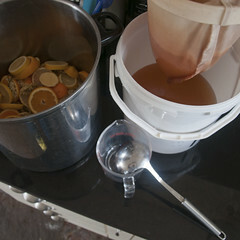 Sinfully Simple Cider - yes, you really can brew this at home! © 2011-2018. All rights reserved (except as specifically indicated). Please contact the author with any requests to use the content, at kate@countryskillsblog.com.